8.1 Q: I heard you could grow leeks from kitchen scraps? 8.2 Q: Are there perennial leeks as well as annual leeks? Luscious, delicious leeks! They’re on every fine chef’s menu somewhere. In the UK, they’re a staple part of the daily diet, and they appear heavily in Asian cuisine as well. Leeks are found in the most elegant dishes and at the finest restaurants. But they’re also in the finest of gardens, too. Today, we look at the leek, explore some of the diversity of this allium, and learn the best way to cultivate these culinary delights. Leeks aren’t anywhere near as intimidating as they appear, and they’re well worth the time and effort spent growing them! Fertilizer Compost-amended soil. Can also use fish emulsions or kelp-based liquid fertilizers or a slow-release granular fertilizer. By now, you’re probably asking exactly what is a leek? The leek vegetable is a part of the allium species of the lilaceae family. This is the same family of plants that encompasses onions, garlic, chives and many other pungent species. Like the onion, a leek grows in layers, although it is most similar to the green onion in that regard. Where do leeks grow? That’s also a common question. The leek has a long history. Originally cultivated in central Asia, it spread throughout Europe due to its tasty nature. Eaten by the Egyptians and the Romans, it rapidly established footholds in most cuisines of Europe and northern Africa. Later, it came to the New World with the settlers, taking its place in the Americas. These tasty vegetables have a subtler flavor than the onion, and are often compared to scallions. However, they tend to be quite mild, unlike their more pungent relatives. Roxton 85 days Uniform stalks. Does not bulb. Bright green leaves. Can be hard to find. 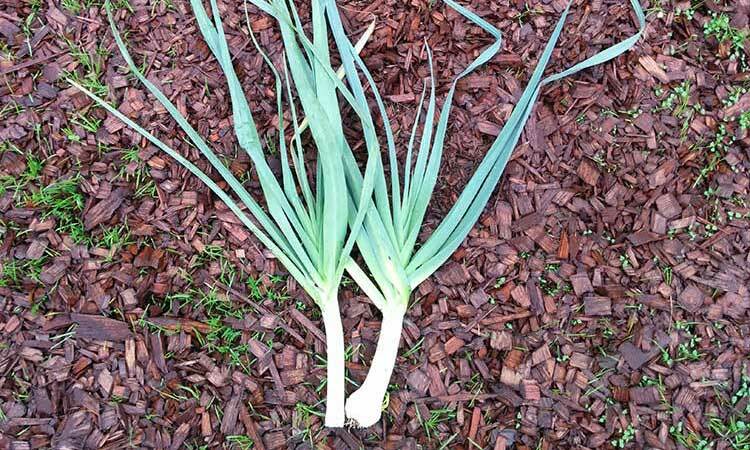 Planting leeks can seem daunting, but it shouldn’t. These are surprisingly forgiving plants and are super-easy to grow! There are two types of leek plants: early season, and late season. Early-season leek varieties are generally planted in the spring for harvest in the late summer or early fall. These tend to be quicker-growing cultivars. They’re often smaller than late-season species and tend to be even milder in flavor. Some of these varieties are harvested as baby leeks for culinary use. Late-season leeks are also planted in the spring, but they’re harvested in late fall and even into winter. These varieties take longer to grow. They’re also cold-hardy and can tolerate gradual temperature changes. A few varieties can be planted in the late spring for fall/winter harvest. Most leeks can be planted anytime after the last frost has passed. If you’re direct-seeding them, you can do so about four weeks before the final frost, and they will come up in the spring. If you are planting from seed, it’s best to start leeks in the late winter using a seedling heat mat and grow light. This gives them the warmth that they need to germinate. It also ensures that they have ample light even in the darker months of the year. You can direct-sow leeks after the danger of frost has ended. However, direct seeding for the leek plant can be tricky, as they don’t like being planted deep and spring rains can wash the seed away. If you opt to do this, it’s generally best to have some sort of cover protecting your garden until the leeks have sprouted. Plant in tilled rows or in a raised bed. You can also use them as an edible ornamental, as their fan-shaped structure lends itself well to flower backdrops. Be sure that wherever you plant them, the soil is amended to at least 12″ deep with a good amount of compost for best growth. You can also grow leeks in containers. If doing this, be sure to space them out a bit. One thing leeks do like is a little bit of room for their roots to spread. While they will still grow well in clusters of 2-3 plants, much more than that and they won’t thrive. When growing leeks in containers, it’s also important to be sure the soil stays moist. You will also want a wide and deep enough container to allow for mounding soil around the stalks to blanch them. Once you have young seedling leek plants, there are a few options that you can use to plant them. My personal favorite is the hole method. When you start your leeks, you can germinate multiple plants in a single seedling starter tray. When they’re ready to transplant, take clumps of leeks and gently swish their roots around in a bucket of water. This makes the soil separate from the roots. You can then carefully separate the clumps of leeks into individual plants. Make a 4-6″ deep hole using a shovel handle or wide stick. Gently set a seedling into it, making sure the tips of the leaves are above the soil level. Sprinkle a tiny dusting of soil around to cover the root. Don’t fill the hole in completely, as nature can handle that. Just be sure the roots themselves are covered. The leek will grow just fine. If you have lots of plants, you can use the trenching method. Make a long, deep trench. Place a leek in it and push the soil around it, covering the roots. Use just enough soil to keep your plant upright. As the leek grows, push more soil around it to keep the stalk covered. Continue adding soil over time, keeping the stalk covered to promote blanching. For the most part, a leek can take care of itself just fine. However, if you want to have the most flavorful stalks, here’s the best way to ensure a tasty harvest. Partial shade is ideal, but the leek will also handle full sun just fine. However, to get that pure white stalk that we love to eat, the stalk itself must be shielded from the sun so it blanches. While the ideal temperature is 60 degrees Fahrenheit, leeks tend to be fine in most weather. Most varieties are tolerant of heat as long as they have plenty of water. Long-growing, cool-season varieties can survive most light frost conditions. You never want the plant to freeze, so it might be better to place a cold frame over them in very cold climates. This allium likes to have about an inch of water per week once it’s established. When it’s young, it needs a bit more. While the leek doesn’t like a soggy soil, keeping it consistently moist is ideal. You can also mound around the base of the plant with either soil or with mulch. This will help to keep the soil around the roots from drying out too quickly. Leeks enjoy nitrogen-rich and lightly-packed soil that has lots of organic matter. Before planting, work compost through your soil to a depth of about 12″. If you plan on blanching the stalks naturally by starting them deeper, amend the soil to that 12″ depth beneath the lowest point you plan on planting. This ensures that they should have plenty of food to grow on! These are heavy feeders, but they don’t need much more than compost-enriched soil. Work compost into the ground before planting. Some blood or bone meal will also encourage them to thrive. If you want to use fertilizer, choose a slow-release balanced granular fertilizer. You can also use a liquid fish emulsion, or just add more compost occasionally. You can propagate leeks by seed or by bulbil. Most commonly, seed is used as it’s more reliable and you don’t lose leeks to the bulb-producing process. Follow the process for planting seed as shown above and you’ll have leeks. Propagating by bulbils (sometimes referred to as pips) can be tricky. First, your leek needs to be producing bulbils along the stalk, which can be hard to identify while it’s in the ground. If you harvest a leek and find some, it’s worth trying to replant them! Carefully separate the bulbils from their mother stalk, and then tuck the base gently into some soil to entice it to set roots. 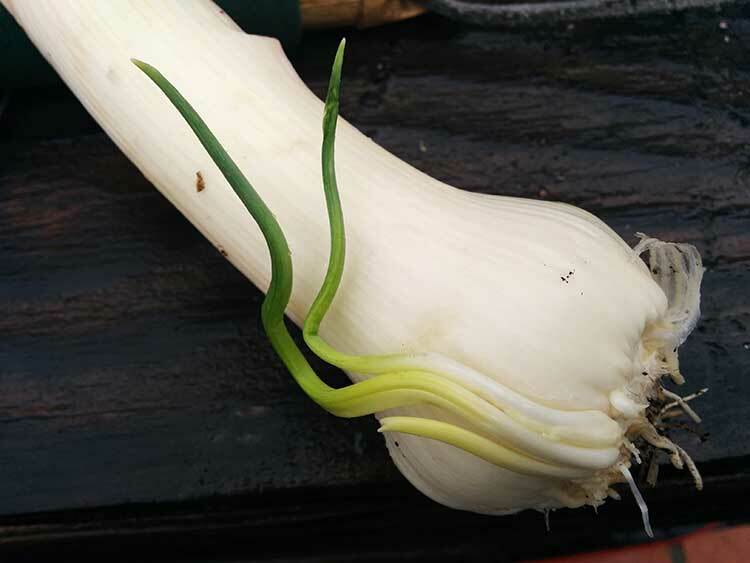 The rooting process can take a little while, but as long as the bulbil’s shoot appears to be green, you have a chance of it forming an exact clone of its parent leek. Once you’ve separated bulbils from the parent, you can replant the parent as well to encourage it to produce more offspring. If a plant is generating a lot of bulbils, it may already be past the edible stage. A plant with only a few bulbils shouldn’t have changed its flavor noticeably. You don’t generally have to prune leeks unless you want to. Some varieties such as American Flag have edible greens which can be trimmed and used in cooking. If you have a variety which doesn’t have bitter greens, you can trim a couple leaves occasionally for kitchen use. Don’t take more than two or three leaves from a given leek during its growth cycle, though! As the leek grows, mound soil around the plants to cover the stalk up to the base of the leaves. This causes the stalk to naturally blanch. It also encourages it to grow taller. 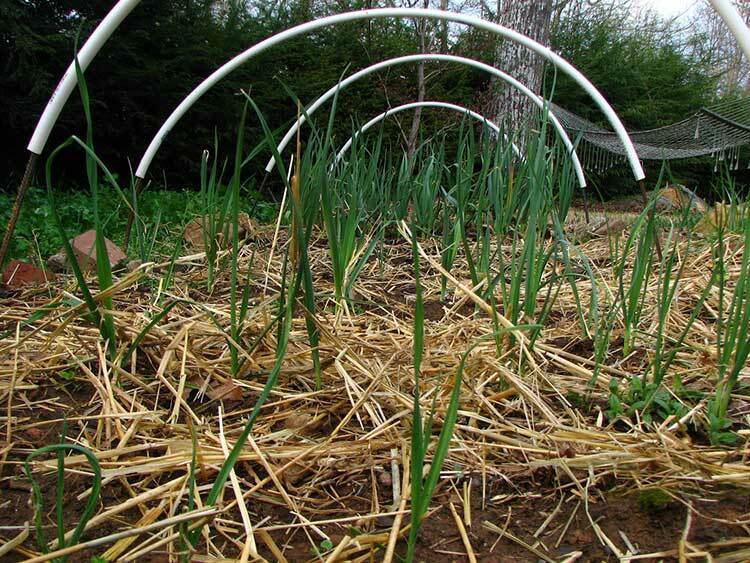 You can double your efforts by planting your leeks in a trench or hole initially, then gradually increasing the amount of soil around the leeks. After all that waiting, you have a fine crop awaiting you! When to harvest leeks can be hard to decide, but let’s go over everything you’ll need to know. 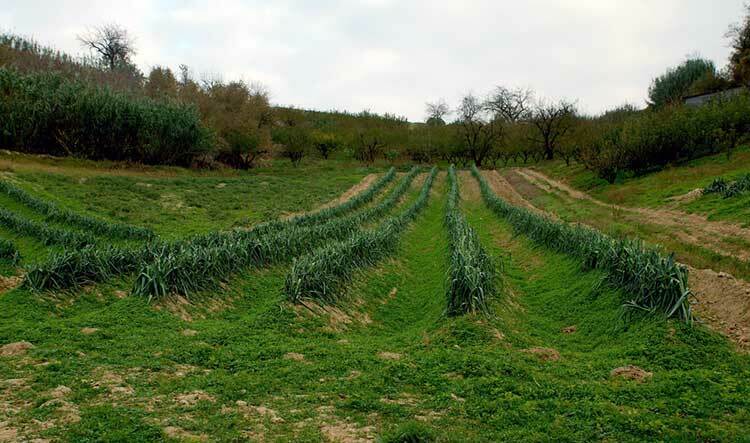 Depending on the kind of leek, harvest can begin anywhere between 60 and 120 days after sowing seed. When the stalk of your leek is about an inch across, it can be harvested and used. It can be used while younger than that, but you won’t have as much produce, of course! As long as the soil is loose, you can simply grasp at the base of a leek and give it a good tug. This will free the roots from the soil, but may damage the outermost leaf layer. If you’re harvesting from heavier clay soil or want to prevent damage, use a digging fork to loosen the soil around and beneath the leek. Shake or dust off as much soil as you can from the produce. Try to keep the roots intact unless you are going to use it immediately, as that helps it store longer. Most leeks store incredibly well in the ground, so you can leave them in place until you need them. If you are going to overwinter leeks this way, hill up the soil around the plants and cover with a thick layer of mulch. This will keep the base of the plant warm and allow it to store in place. Leeks, like most other onions, can be stored outside the refrigerator as long as they are in a cool, dry place. If storing your leeks, do not wash them. Instead, dust off any soil remnants and let the exterior dry out. In optimal conditions, they can store for up to three months. If you plan on using your leeks soon, they can be stored in the refrigerator. 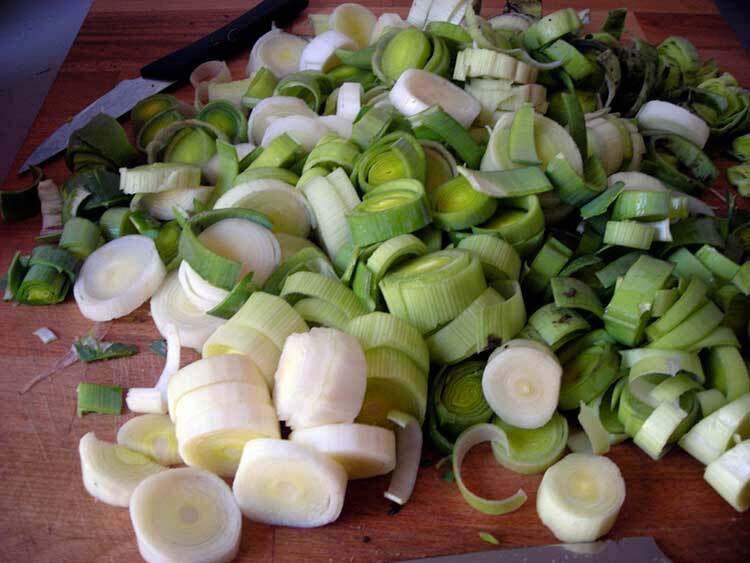 Trim off the excess greens and wrap each leek in plastic wrap, covering it completely. Place them into a plastic bag and use within two weeks. 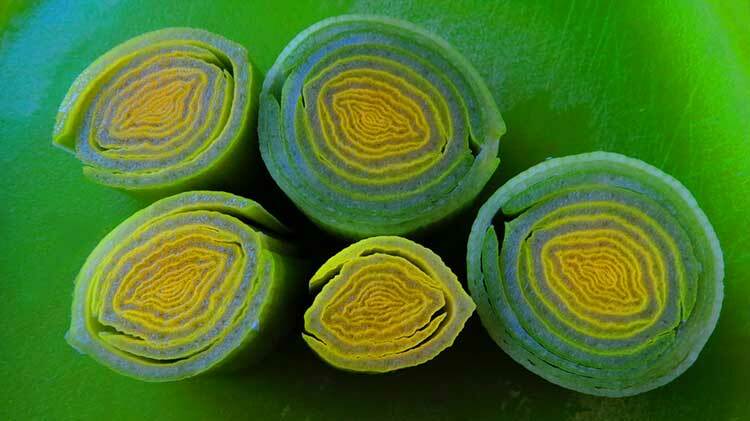 Leeks do not freeze well, as they turn mushy due to cell wall breakage. Similarly, canning will turn them mushy, so that isn’t an option. These do dry quite well in a dehydrator. Slice them into fine slices and put them in a dehydrator set at 145 degrees Fahrenheit until they are crisp. Store in an airtight container out of direct light. If storing for a longer period of time, add a moisture-absorbing packet to your leeks. 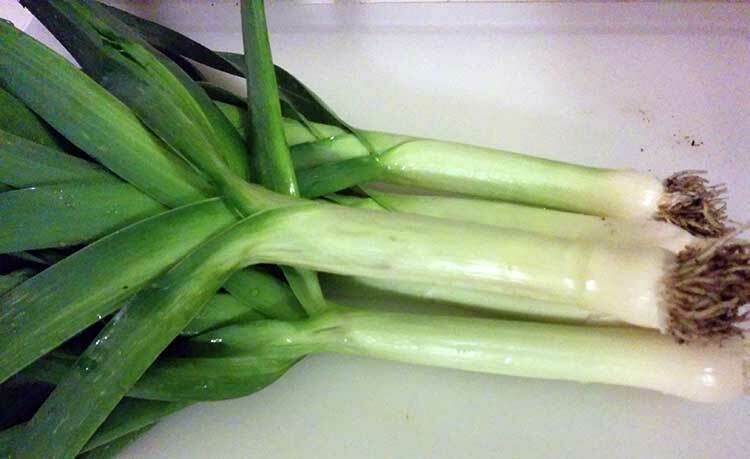 One of the most common problems with these is that some people have thin or spindly leeks. The cause is overcrowding. As leeks are heavy feeders, too many in one spot will cause them all to have problems! Be sure to thin out your leeks. Ideally, 6″ apart is a good range to aim for. You might be able to grow them closer, but you may still find them to be too thin. Now, if you’re like me and you forget to thin them, and find that you have clumps of 2-3 growing together, fertilize them regularly. You can use a fish emulsion, kelp meal, or thick layer of compost. I’ve also had good success making organic fertilizer tea or compost tea and using that. Some people deliberately grow this way to maximize their harvest in tight spaces. While we love to see other kinds of flowers, a lot of people dread seeing their leek flower. Flowering renders the stalk woody and causes it to go bitter and inedible. Most leek flowering comes from sudden shifts in the weather. If it was hot and then suddenly cold, this can cause your leek to panic and go to seed. To prevent this, try to avoid massive temperature shifts. While that’s difficult (especially in some areas, like southern California where it can be 90 one day and 60 the next), it can be done. When the weather goes cold, put a cold frame over your plants before they get too chilled. Gradually allow them to acclimate to the new conditions. If the leek does send up a flower stalk, harvest the stalk before it blooms. Congratulations, you now have what’s called a leek scape! This tasty flower stalk can be used in cooking for a mild oniony flavor, and is actually quite prized by chefs. If you catch the scape while it’s still small, your leek will not suffer, and you’ll still be able to harvest and use it too. In the United States, the leek is one of the few plants that is almost entirely pest-free. 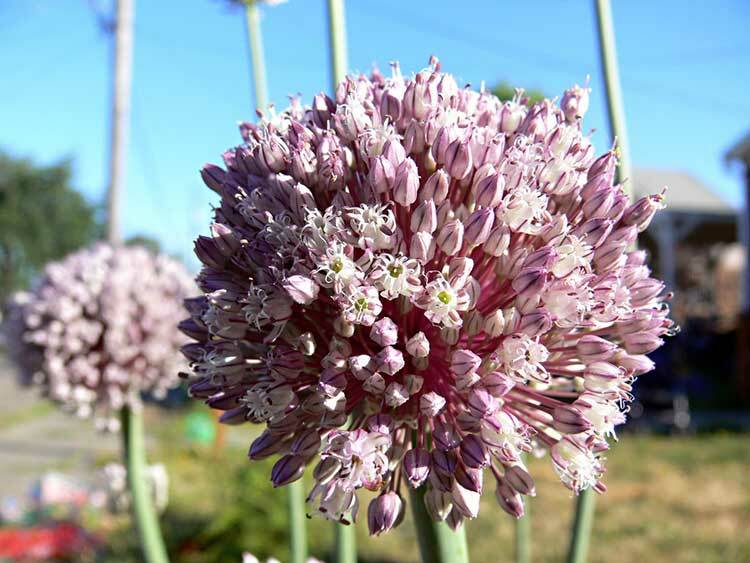 Like other alliums, most pests avoid the pungent onion, garlic, or leek leaves. They’re just too strong for our pests. However, in the UK, the leek moth is a concern. The larvae of the leek moth are tiny caterpillars that tunnel into the leaf stalk to feed, causing brownish patches. Older caterpillars may tunnel directly down the center of the stalk, causing possible rotting or withering issues. After a month or so of feeding, the caterpillar will then pupate on the plant foliage. While the leek moth is a problem, using a product that controls caterpillars such as Monterey BT will help wipe them out. You can also remove and destroy affected leek plants, which destroys the larvae inside it too. Hand-picking larvae and preventing moths by using floating row covers also works well. There is one other pest which can attack your leeks: thrips. These small bugs can be controlled by releasing beneficial insects such as ladybugs and lacewings into your garden. However, you should also keep the area near your leeks clear of plant debris and grass. Mulch is fine, but debris or living grass is a home for the thrips! If your leek patch has a severe infestation of thrips, you can still save them. You can use neem oil to deter the pests. An insecticidal soap will also work in a similar fashion. A good choice would be Safer Brand Insect Killing Soap. Finally, pyrethrin-based sprays will kill thrips if nothing else works. Some good options for pyrethrin sprays include PyGanic and Take Down Garden Spray. Leeks are mostly disease-free. The only diseases which typically impact them are those typically caused by humidity or moisture on the leaves. Thus, rust or powdery mildew can become problems, as can white tip disease. Rust is a fungal infection that looks like orangish patches on the leaves. If you discover rust on your leek, don’t panic! Rust is generally just a cosmetic issue. As it tends to impact the leaves more than the stalk, and we prefer to eat the stalk, you can simply remove any rust patches you discover and destroy them. To prevent rust, rotate your crops regularly so the fungus can’t take hold. You can also use a fungicide such as Safer Brand Garden Fungicide to control rust when it appears. Powdery mildew isn’t common on leeks, but it can happen, especially if other nearby plants are suffering from it. To treat this, spray neem oil on all leaf surfaces. It should clear up very quickly. White tip disease, also referred to as white tip of leek, is a fungal infection. It usually results from infected soil splashing up onto the leaves, and can also impact onions. While it’s far more common in the UK than elsewhere, it’s not entirely unknown in the United States. You’ll need a chlorothalonyl fungicide such as Bonide Fung-Onil to repair plants suffering from white tip. Q: I heard you could grow leeks from kitchen scraps? A: You can, but only if the leek has roots still on it. Cut off the bottom of the stem, leaving at least an inch to an inch and a half of the base. Place the root end in a cup of water, and put the cup in a window where it will receive lots of sunlight. Every day, rinse off the end of the leek and change the water. Within a week or so, you should see green shoots forming. At that point, you can plant the leek in potting soil and let it grow! Q: Are there perennial leeks as well as annual leeks? A: There are indeed! 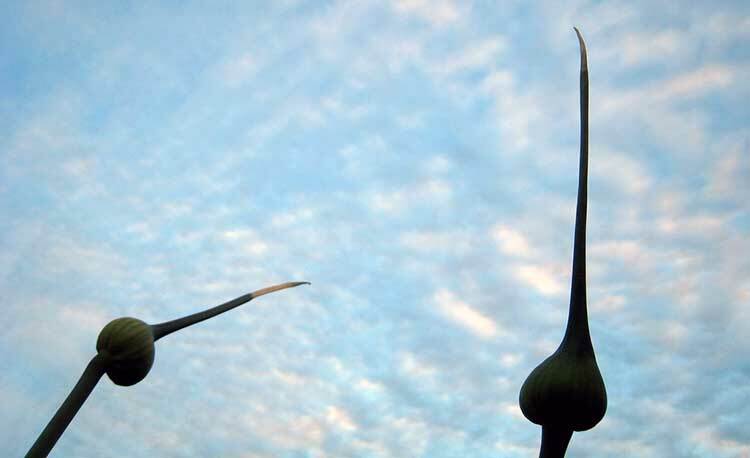 Perennial leeks actively form new bulbils much in the same way that a shallot does. Annuals may form bulbils, but they only really come to the forefront when the parent plant is past its prime and ready to go to seed. The flavor of perennials is slightly more onion-like than an annual leek, as well. But the majority of leeks that are commercially available are annual varieties for their distinctive flavor. In short, if you haven’t grown this delicious staple of the chef’s table yet, you really should. It tastes absolutely wonderful in soups and stews, and it’s easy to grow. My favorite kind is the American Flag variety. What’s yours? Let me know in the comments! When my leeks went to seed, only half made seeds. The rest formed bulbets which were already growing inside the sheath. If I plant these now (July) will they survive a mild winter and be good to harvest next spring and summer? I have many hundreds of them. I’d imagine they’d do OK, but would probably take longer to get to full leek size. Definitely worth a test if you have that mild winter! I once found that after my fathers day lillies and gladiollas past flowering, that runningover them with the mulcher that the top greens thrown into the yard produced a greenermorelush yard… MY QUESTION IS… Will the green tops of leeks,(similar to tops of glads) chopped fine, produce the same effect as fertilizer? Actually, yes! Nearly any chopped plant material will provide nutrition to other plants. Leek greens are nitrogen-rich and should act as a fertilizer as they break down. However, it might smell oniony when they’re fresh, so be prepared for that! I personally recommend composting most green materials when you can. Composting them in advance ensures that they’ve had time to break down a bit, making the nutrients more available to the plants. If you’re hot-composting, it will also kill off most plant diseases and sterilize seeds so they won’t sprout. And it ensures you don’t have problems with molding plant matter in your yard, which can happen if weather conditions are mild. But there’s nothing wrong with a green mulch. Many people will mulch their grass clippings straight back into their lawn, for instance. Just be sure that water can penetrate the plant matter, and keep an eye out for any unexpected issues or unwanted pests!